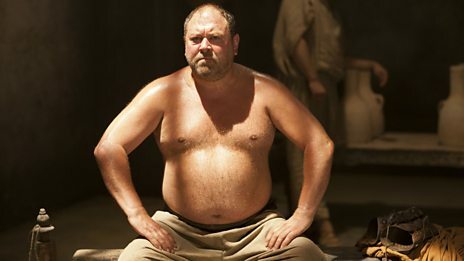 Home / Atlantis / BBC / Mythology / Reviews / TV / [Review] - Atlantis, Series 1 Episode 6, "The Song of the Sirens"
[Review] - Atlantis, Series 1 Episode 6, "The Song of the Sirens"
Can we take a moment to recognise how very smooth Mark Addy's stomach is? That wouldn't be the sort of thing I'd normally point out, but it was the focus of the closing moments of last week's episode, and this episode began cold with Pythagoras rubbing the spherical tum down with oil, an image I never wanted in my head, but it's here now, so I guess I'm going to have to live with it. Belly's aside, this was not only the strongest episode to incorporate mythological elements, but possibly the strongest episode thus far. It built in a background of motivation, managed a fine balance of intrigue and humour, and introduced the most interesting antagonist the show has yet devised. If it weren't for a bit of a fumble at the very very end, I'd say it was as perfect an episode of this series as we could hope for. And it probably is. Hit the jump for the review, which contains spoilers that are aware that Hercules doesn't like birds. The mythological elements in play this week were almost exclusively taken from Homer's The Odyssey, though in various arrangements. And somewhat as a vindication of my supposition skills, two prior statements I've made in these reviews were proven correct. I had previously said that this version of Pasiphaë was more a combination of her mythical sister Circe and niece Medea than the actual namesake, and low and behold this episode reveals that Circe, a witch of legend (and occasional Wonder Woman villain) is Pasiphaë's sister here as well. One wonders if Medea might not put in an appearance at some point in the future as well, or if she has been completely absorbed by the Atlantian Queen. I also correctly predicted that the Goddess from which the witch sister's derive their magic is Hecate. So... yay me. But some backstory. The Witches of Colchis is a blatant reference to Medea, and the foreign country of her origin where the Golden Fleece is kept. It is also the first time an element from the myth of the Argonauts has been referenced, as despite the hero here being Jason, his exploits have went thus far unplundered. The episode did an excellent job of misdirection, setting up the Argonaut reference, then swapping it out for the more familiar Odyssey material. Circe was a witch-nymph, with a tendency to turn those who earned her ire into animals (though pigs are the most frequently referenced, she was capable of any kind of animal transformations). There is often some confusion between Circe and Calypso, the former never actually being evil, but essentially a decent person if caught in the right mood. Calypso was more out and out mean, keeping Odysseus prisoner with her for seven years out of jealousy and spite. The Circe of myth was emotional and prone to over reaction, but was ultimatly helpful, giving Odysseus valuable information to complete his trip home. This original interpretation seems to have carried over into the series, as the Circe that Hercules (and later Jason) appeals to is manipulative to be certain, but considering her condition, and what we know of Pasiphaë, I would guess entirely warranted. She has been driven to an extreme, and is taking the only course available to her. That the course happens to include a little blackmail and murder is incidental. Also culled from the Odyssey, though in a less authentic manner, is the titular Song of the Sirens. The Sirens were the cursed attendants of Persephone, who sang a mourning song which was irresistible to sailors, who would drive their boats into the rocks of the Siren's island. The song of myth was a little bit intoxication, a little bit mind control. The song here was treated as other stories would a love potion, and I couldn't help but think that Greek myth has an analogue for that already, one that makes considerably more sense, though is also considerably more cliche: Eros' arrows. As for the episode itself, everything worked in just the right way. Hercules' attempt to sway Medusa's favour with magic might have been an entire episode in itself. So too might have been Hercules' transformation into a pig, full of hijinks's and padding and Pythagoras being as useless, as prior episodes have been. Instead, Lucy Watkins rightly noticed that these are smaller plots that burn themselves out after an act, and they each work better leading into each other, and all work the best to establish not only a new threat, but an on going arc. Jason's general uncertainty about his parentage, and Pasiphaë's manipulations are not enough to structure an entire series around, there needs to be a clear and present danger to force the heroes into action. The addition of Circe, and Jason's pledge, now give the show that. It's just a shame that it had to wait until the half way mark of the series before it was introduced. It was only in the closing moments, when everything seemed to be resolved very quickly, that I felt the episode lacking. Hercules gets turned back into a man without incident, Medusa's skin condition clears up in a jiffy, and life returns to normal, as Jason goes to consult the unhelpful Oracle, whose "I know everything you need to know but won't tell you just now" bit was annoying in episode one, and is downright unwelcome now. I, for one, found Circe (Lucy Cohu) a far more engaging and interesting character than Atlantis' breathless seer. She at least was honest about her intentions, and straight forward with information when pressed. Which is more than anyone else on this show can claim. Hercules and Medusa continue to be the only of the central characters getting any characterisation, with Jason's personality apparently set in stone (though hopefully his promise to Circe will cast some doubt on his abilities). And finally we got a better look at Pythagoras. Unfortunately that look clarified something I had begun to suspect: he's a terrible friend. Hercules may be selfish and arrogant, but he's come through in the pinch a few times. Pythagoras is cowardly, willing to simply let others die rather than risk his own life, and actively mean. His constant berating of Hercules isn't friendly banter or manish emotional avoidance. It is active bullying: he is putting Hercules down at every available opportunity. If this were the exact Hercules of myth, he'd snap the little twerp's neck one night after draining the wine skin. I found the character pointless before, now I find him aggravating. Here's hoping he'll be dispatched in some horrible way, so as to add emotional weight to Jason's heroic journey. As a final note, the "creature" that featured in this episode escapes me. As in the pilot, the creature was clearly meant to be a monster of myth, but was not named and was unidentifiable. I assumed the creature Jason encountered in the pilot was meant to be a Hydra, because there aren't that many multi-headed lizards in Greek myth. But this creature clearly took inspiration from European dragons, which makes identifying it harder. Greek dragons tended to resemble serpents rather than bats, so creatures like Ladon, Typhon, and Python are obviously out. The dragon of Colchis was, again, less batty, as was Cecrops. Pyrausta had wings, but was insect sized and lived in fire. Delphyne and Lamia were snake based. In fact, the only creature from Greek myth that occurs to me that had bat like wings were the Harpies, but they were horrible woman creatures, and not at all reptilian. So, if anyone has an idea as to what it was that Circe summoned form her pool, and that Jason slew with one bite of his sword, please share.